Abu Dhabi: A large number of students gathered at Zayed University in Abu Dhabi campus to refresh their knowledge on key art periods and learn more about major artworks drawn from diverse corners of the Arab world. Organized by the College of Arts and Creative Enterprises, Sheikh Sultan Sooud Al Qassemi, Founder of Barjeel Art Foundation, engaged in an interactive discussions with Zayed University students, fostered a critical dialogue around contemporary and modern art practices, with a focus on artists with Arab heritage, and shared captivating ideas and stories in a lecture held under the theme of “The Politics of Arab Art”. The Barjeel Art Foundation was founded with the vision of creating a space where artwork drawn from diverse corners of the Arab world can coalesce in an interactive and communal setting. Art of the Arab world is as nuanced as the nations that comprise the historically, politically, socially, and geographically diverse region. The Foundation also aims to exhibit works of established and emerging Arab contemporary artists in a public display that is unique to the region. Barjeel’s guiding principle is to extend the privilege of viewing eminent pieces of Arab art to the community at large. In his address to Zayed University students, Sheikh Al Qassemi said: “I am inspired and impressed by artworks of Abdel Qader Al Rais, one of the most-acclaimed artists from the UAE, for his distinct style. His artwork on the Palestinian Intifada in 1989 showed the struggle that he encountered to no longer draw figures driven by his religious beliefs. Instead, he concentrated more on sweeping landscapes, architectural studies and abstract forms,” Al Qassemi said. During the lecture, students were actively involved. They raised many questions about different artworks including paintings and sculptures. The event was also attended by Dr Marilyn Roberts, Provost at Zayed University, Ann-Maree Reaney, Dean of the College of Arts and Creative Enterprises, and faculty members. The talk also included a presentation of artworks for famous Arab artists such as Abdel Hadi El Gazzar, an Egyptian painter who occupied a unique position among the artists of his generation, Nouri Al Rawi, who played a pivotal role in the development of modern Iraqi art, Kadhim Haidar, whose work examined important shifts in Iraq’s political environment in the 1950s and 1960s, Jawad Salim, an Iraqi painter and sculptor especially known for his Nasb al-Hurriyah (Monument of Freedom), Ragheb Ayad, a pioneer of Egyptian modern art who made significant contributions to expressionism in Egypt, Mona Hatoum, a Lebanese- born Palestinian video artist and installation artist, Dia Azzawi, who is born in Baghdad in 1939 and internationally recognized as one of the pioneers of modern Arab art, Zaha Hadid, an Iraqi-born British architect and the first women to receive the Pritzker Architecture Prize in 2004, and many others. 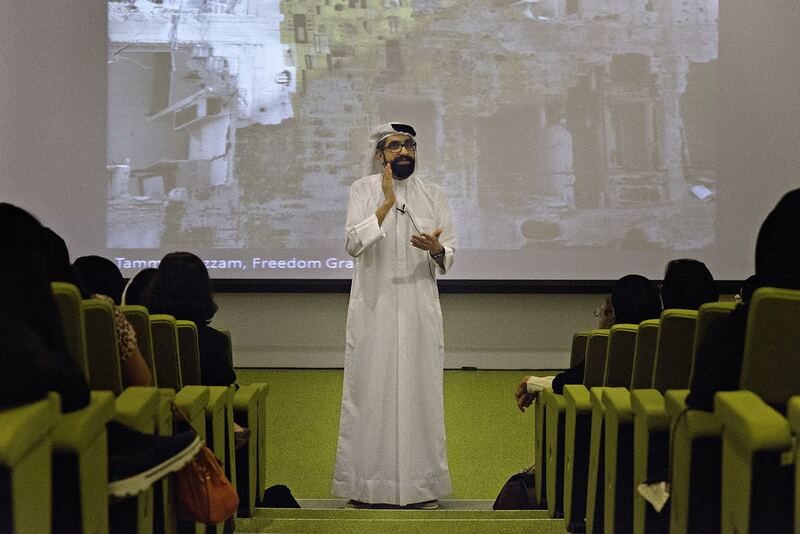 Al Qassemi, who has been described by numerous media outlets as a prominent voice during the events of the Arab Spring, urged students to research and read more about arts in the Arab world that deserves more respect.